One has to wonder how a coin over 200 years old still exists in immaculate condition today! In 1795, someone could have gone to the bank and taken out $10 to pay for their mortgage, or used the $10 for just about anything else they wanted too, but instead, they fell in love with a beautiful piece of art and decided to buy this coin. And for the past 215 years, the owners of this coin have done a fabulous job of carefully preserving such a significant U.S. coin for so long. The 1795 Eagle pictured here is graded MS65 by PCGS and is one of only two in this grade with none graded higher. This MS65 example is currently valued at approximately $1,000,000 and is considered a condition census example since it is one of the finest-known. An example two grades lower recently sold for $322,000, proving that this coin is truly scarce in almost any condition. Whoever saved this coin 215 years ago passed down the opportunity for a keen collector to own a great numismatic rarity. What's even more amazing is that there is one lone example that is graded even higher in MS66, but unfortunately, we don't have images of this particular example. The 1795 Eagle is a very important and significant coin. 1795 was the first year in which the U.S. Mint struck gold coins and it also included the first $10 gold piece. 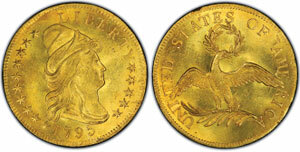 Additionally, there are two different major varieties of the 1795 Eagle, making it even scarcer if collected by variety. The most common variety is recognized by the 13 leaves in the eagle's claws. The scarcer variety has nine leaves in the eagle's claws. This coin was America's first $10 coin issued for circulation during an important time in American history. Therefore, owning and even seeing one of the estimated 325 known examples today, is definitely a great privilege.